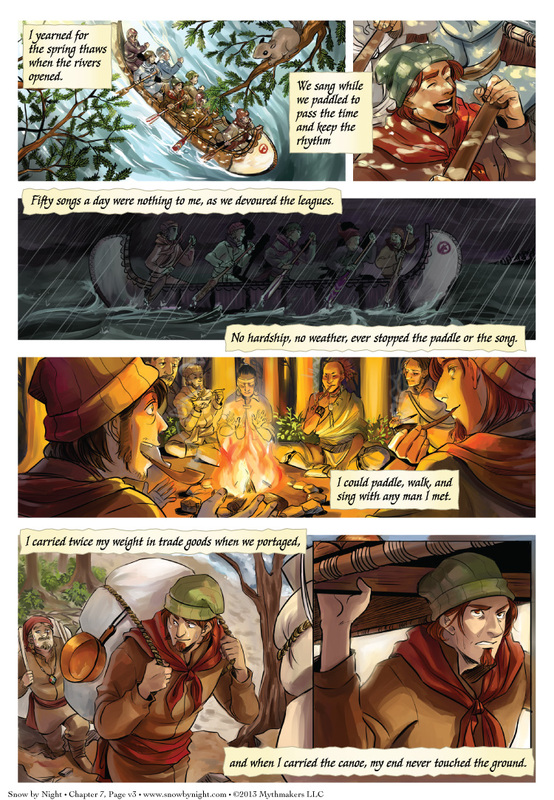 Peyre explains his love for the life of a voyageur in Page 3 of A Life So Free. The voyageurs were the long-haul truckers of colonial French Canada. They paddled canoes loaded with trade goods from Montreal to the native towns on the Great Lakes then made the return trip laden with furs. They were strong men used to adversity and were not a breed to be trifled with lightly. To see a preview of page 4, please vote for Snow by Night on Top Web Comics. This weekend, Brittany and I will be attending NekoCon in Hampton Roads, Va. Come by and see us. We’ll be bringing books, prints, and buttons, as well as friendly chatter and some tall tales. Don’t forget to check out Sunset Grill when you get a chance. It reminds me of Tales from the Mos Eisley Cantina. And that’s a good thing. Actually when voyageurs portaged, they usually carried more than their body weight. As a results hernias were a common injury among these men. As I understand it, they carried around 500 lb on their backs. The sash which appears in the common image would be tightened down to serve as a back belt, and the delightfully twee little knee garters were actually to prevent their kneecaps dislocating. “… and I died a proud and selfish man…” at least that’s how I read it this far. I might be slightly cynical. Same, lol. It seems he never had the personality to settle down. Selfish of him to sire a family anyway and then leave them all for his wife to raise. He could have done worse. A lot of those men had native wives and a few children with them as well. double the women left behind.